If there is one thing that's 100% true, it's that everyone is different. Every Client I've had has a different interior decor style, preferences, and what they would like to do with their photographs. And while I offer a fairly limited array of products, they actually accommodate many different preferences when it comes to decorating your home with photographs. A simple wooden photo stand with a matted print are right at home on a bedside table or on an open shelf in the living room. They also fit right in in children's rooms, mantels, or on a console table. Pretty much anywhere there's a tabletop surface, you can instantly display your photographs! This is perfect for people who don't want to make a big fuss about putting their portraits on display, but still want to enjoy them on a daily basis. And one of the biggest benefits is that you can change out the print as often as you like! 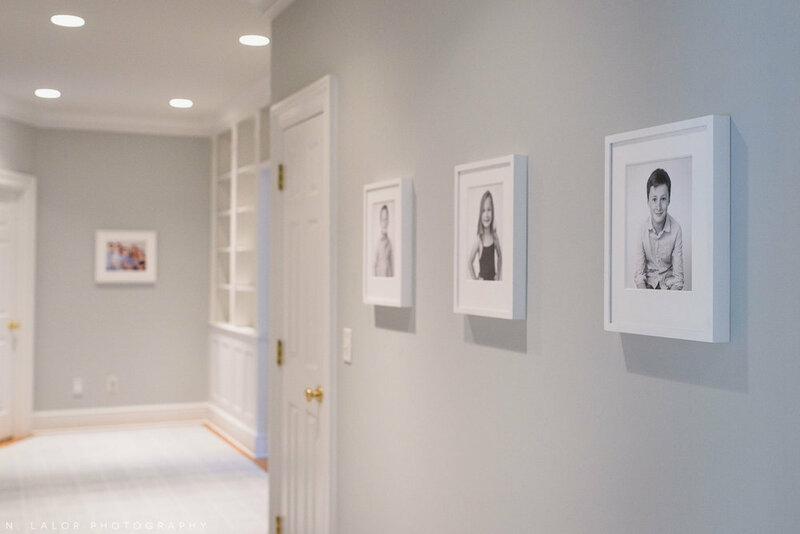 Whether you have a wall of frames already or you want to create one, a gallery wall is a great way to document your family over the years. You can expand it as you go, but it's always a good idea to have a bigger plan in mind. Stick to a specific frame style (modern, traditional, white, black, eclectic mix, etc) and have a theme for the photographs (color, all b&w, candid, formal) to create a cohesive look. Pair smaller frames with bigger ones, or do an organized wall display using the same size. The biggest issue with a gallery wall is making sure all frames are hung straight (both during installation and as they shift over time) as well as consistently spacing the frames in relation to each other. Having paper templates helps. And so does professional installation. *P.S. You may have noticed that I don’t actually have a great example for this one.. that’s because I have yet to do a gallery wall for a client. If you’ve been thinking of doing one of these, let me know! When you're looking for impact, large wall frames are your best bet. Whether they go above the fireplace, by the entrance, or on a large empty wall, large frames will make an impression! Every beautifully decorated home I’ve been in has large, oversized artwork. Art that takes up the whole wall creates impact. It’s bold and intentional, and the biggest upside is that it’s super low maintenance. When you’re not managing frames that are next to each other, you don’t need to straighten them all the time. Sometimes a smaller frame fits right in. Smaller framed photographs look really good in kid's rooms or in smaller spaces like a bathroom. They look great in a row, lining a hallway. As something you pass by every day, you can fit a small frame just about anywhere. A single small frame fills out a smaller space, but you want to be careful of having it carry the visual load of a larger wall. A frame that’s too small makes a space seem unfinished, which is why mapping out a size in a specific spot before you make a commitment is often a good idea. And if it doesn’t work, you can always move the frame to a cozier space that’s a better fit. While I don't currently sell albums (they're always an option if you really have to have one, btw), the beautiful presentation box that holds the matted prints acts like an album in many respects. The biggest benefit of an album presentation is that you can keep your photographs safely contained, flip through them whenever you like, and put everything back on the shelf when you’re done. An album or presentation box looks right at home on a bookshelf or on a coffee table, too. It becomes part of the decor, which is why a high-quality and well designed product is important. In the end, you don't HAVE TO choose only one way to decorate your home with family photographs. You can mix and match to create the perfect recipe for your personal style. For instance, I prefer large framed photographs to a wall of smaller frames. I also love having the smaller matted prints on display in a wooden block stand on the shelf. You might want to create a gallery wall for your family, but that doesn’t mean that you can’t have a large framed portrait above the fireplace, too. The best part about having a curated set of professional-quality products to choose from is that you know you’re making the best choice. No matter what! Older PostWhat is Archival Printing?